This is the place to visit to get current on Giving Committee activities and requests. Back in 2015, Kae & Dionne, the Giving Committee co-hosts at the time, led us in making several Liberated Staircase quilt tops. At least two (a blue one and a yellow) became completed quilts and were donated. Two more patiently waited, and thanks to Deborah Christensen, this green one is now done too! Fraser Valley MQG Spreads the Love! 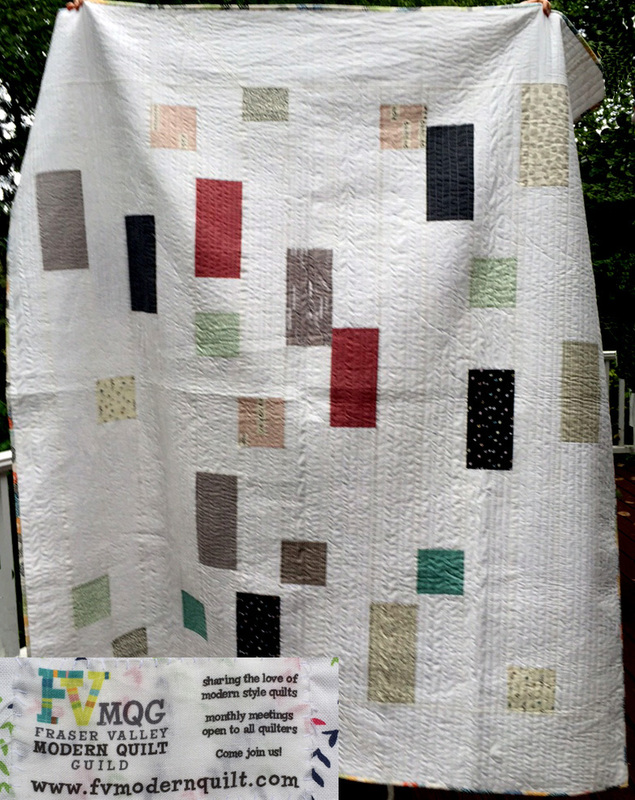 At #EPICmeetup2015, members of the Fraser Valley MQG gifted the SMQG Giving Committee with some charitable love: a completed modern quilt for us to give to our charity of choice! Since we have now met our goal of 13 quilts for residents of Plymouth Housing, we will be looking at a 2nd beneficiary for any remaining quilts made by the Giving Committee in 2015, including this gift from the north. 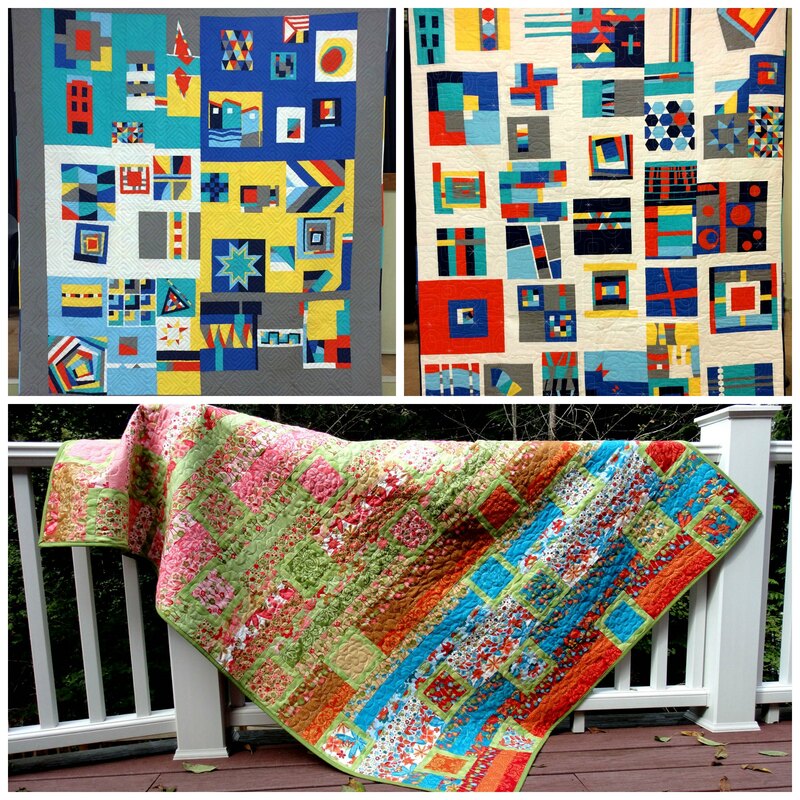 In our next post, we’ll share pictures of all the Giving quilts made but not yet pictured on this blog. Another month has blown by, and there has been plenty of Giving all along the way. The yellow liberated staircase quilt has been assembled and is ready for quilting. Kae will be showing the top at the April 8th meeting. Kae will also be collecting the blue blocks for the next two staircase quilts. Here’s a picture of what the blue blocks look like, mocked up. Nice, don’t you think? The quilt that was displayed at QuiltCon’s charity display has returned home safely, and is ready to be gifted to a recipient at Plymouth Housing. 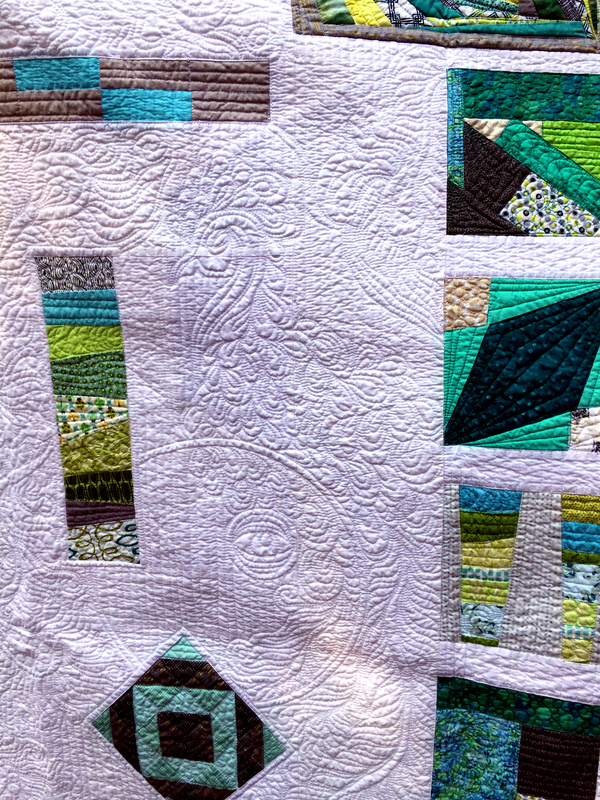 Did you see the beautiful quilting that Megan Riley did on it? Here are a couple of nice pictures. Other things on the horizon: The 3 quilts that were assembled at our Charity sew-in are ready for quilting. Two of them have been handed off to quilters for their contributions. If there is anyone else out there interested in quilting one of these, let Kae or Dionne know. Gosh. It’s barely (not) still February! We had our first ever Giving/Charity Sew-in February 5th. Participants worked alone, or in small groups to create unequally sized “quadrants” for 3 more quilts for Plymouth housing. Pictures forthcoming. We now have 3 more tops ready for quilting. Anyone? Anyone? let us know if you are interested. They are approximately 60″ X 80″ each. 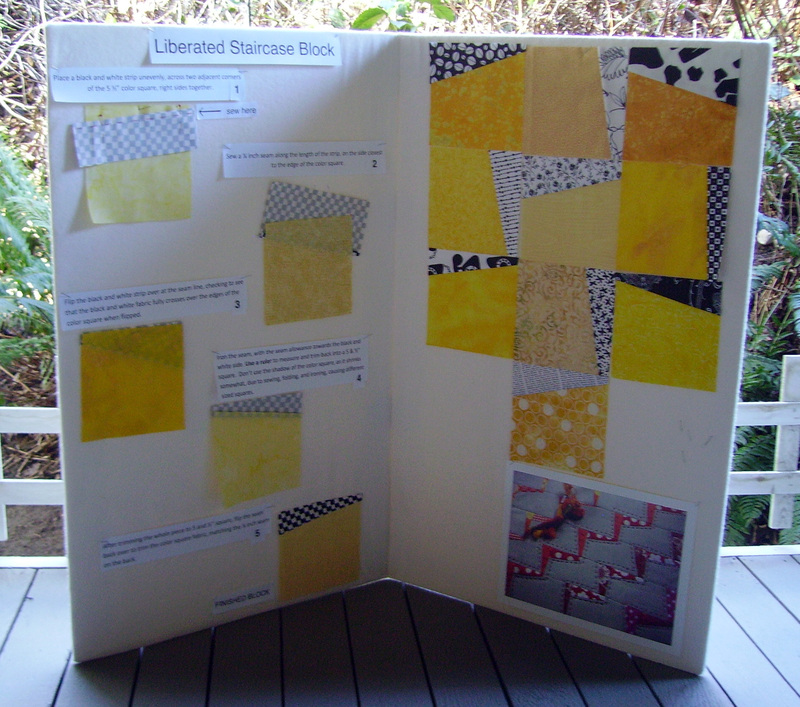 We also debuted a new group participation Giving Quilt opportunity: the Liberated Staircase Block, (our name). At February’s meeting, we distributed packets containing black and white strips, and yellow 5 and 1/2″ squares. Members are currently making the staircase blocks, and we look forward to receiving them at the March meeting and putting them together at sew-ins. If you picked up a packet at the February meeting, please remember to bring (or have a buddy bring) your completed blocks back to our March meeting. At the March meeting, we will hand out more packets, using a different solid color. You’ll have to come to the meeting to find out what that color is. 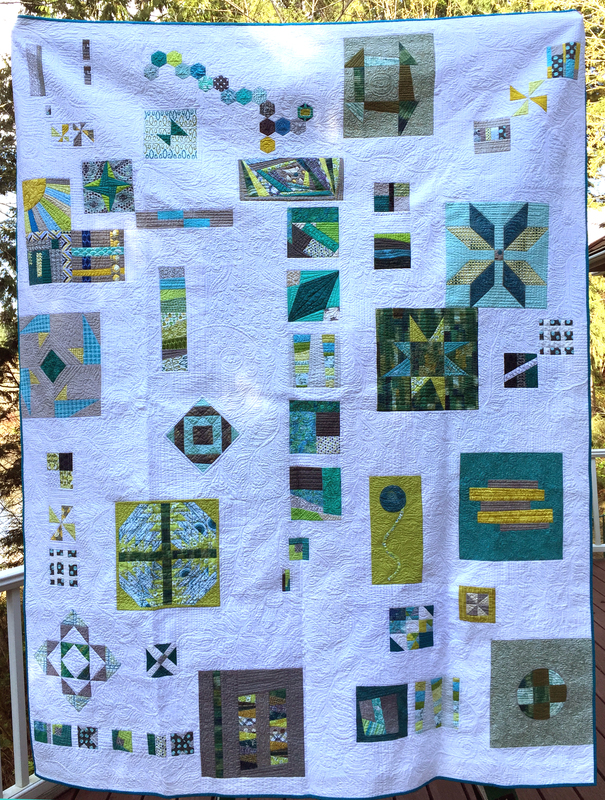 Our QuiltCon Charity Quilt Submission, (beautifully machine quilted by Megan Riley) should be heading back home very shortly. Word on the street is, that the quilting in particular, was admired and given appropriate shout outs by many show viewers. This quilt will be taken to Plymouth Housing shortly after it is returned. See you at the March meeting! There will be a Charity/Giving ONLY Happy Hour at QuiltWorks NW on Thursday, February 5th. All guild members are invited, but only giving committee projects will be worked on here. We will be making tops out of the remaining BOM blocks that we received the 2nd half of 2014. We have set a target of making quilts for all 13 of the originally nominated residents from December. There are 2 quilts that have already been delivered, 2 quilts that are completed and currently on display, and another 1 that awaits quilting. According to some very complex mathematical computations, another 8 remain to begin and finish before we meet that goal. Folks are welcome to drop in at any time, but the actual hours of the sew-in are 3:30 PM to 8:45 PM. To play with us, all you need is a machine and grey thread. If you can bring a couple of rulers, a rotary cutter, and a cutting mat, that would be an added bonus. Dionne and Kae are providing pizza and beverages for those who come and play along. No Kidding! Additionally, Clothworks has once again generously donated a bolt of dark Grey American Made Brand fabric that we will use for joining blocks together at the sew-in. Did we mention that there will be a very cool door prize? Indeed. The mysterious prize vault was cracked open, and a coveted item was extracted for one of you eligible ladies and gentleman! To be eligible, come help build quilt tops, eat pizza, be merry, and your name will be added to the hat. We’ll announce the winner via blog post. We are still collecting modern-friendly black and white print fabrics for the next chapter in our Giving Committee efforts, the details of which will be “unveiled” at our February guild meeting. We’ll continue to collect those fabrics through February. Please remember: the intention is not to pass off or donate things that we have decided are not useful or attractive to us, but to use materials that we are proud of, for quilts that we can also be proud of, given from the heart. I am reminded of the stereotype of rummaging through one’s canned foods and pulling out the expired can of water chestnuts and to give to the food bank. Let’s do the opposite of that! 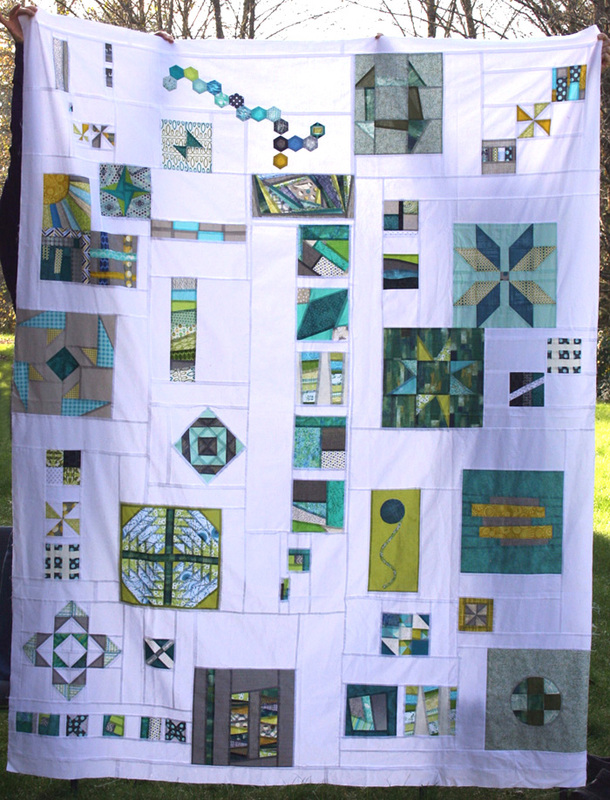 This month, we completed the QuiltCon Charity Challenge top and backing. Deborah C. and Martha had fun with giant hexies, as they volunteered to make the backing at retreat. Megan Riley will be doing the custom quilting on this one. There are still several more quilts to be made from the original BOM collection that so many of you generously contributed to. So far, these have been getting assembled at sew-ins. If anyone would like to take a group of blocks home to make a quilt top for Plymouth Housing, Let Kae or Dionne know. At the November meeting, we began collecting black and white fabrics for the next set of Giving quilts. Please share your black and white fabrics, in pieces no smaller than 10” square. Bigger is even better. 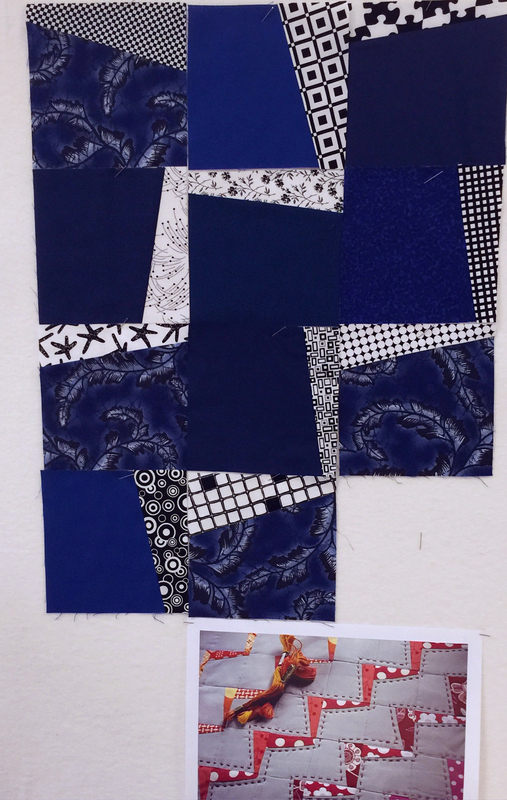 The next opportunity for members to make blocks with those new fabrics will begin in February, 2015. With this new challenge, we will be leaning more toward gender-neutral color-ways, so that the quilts might speak to both the men and women at Plymouth Housing. 2 Quilts are going to Plymouth Housing this month. One of them will be held back to be shown either at QuiltCon, or our January show at Island Quilter. Meanwhile, at the last QWNW sew-in, (Sept 27) we started designing the top for the next Plymouth Housing Quilt from the recent colorway, (aqua/light blue, citron green, greys and white/ivory/neutrals). It looks like we will be able to make 3, or possibly 4 quilts from the blocks that were collected from you in that color grouping. One of those 3 quilts is intended for the QC Charity Challenge. Given how we go through solid white fabric with such gusto, we reached out to Clothworks and asked them for a bolt of their American Made Brand fabric in white. The answer was Yes. We will be picking up a bolt from them in a few weeks, as soon as their stock has been replenished. A new group of projects, of course! For this, we are asking for contributions of Black and White fabric that are at least 10” square. Bigger pieces are welcome, too. Please keep in mind that white is not cream! If you are not sure whether the fabric that you are considering contributing fits into the white or cream category, please bring it to Kae or Dionne, and we’ll look at it next to our own samples. Please bring your contributions for the next set of projects to any SMQG meeting, or QWNW sew-in. We will be thrilled to collect them from you! We will be handing out block-making packets for the new project group at the beginning of 2015. Details coming up!